In Turnabout, Candidates With Less Spend More, Candidates With More Spend Less : It's All Politics Candidates with the least money to spend are showing up in TV ads more often. In another twist, nice guys aren't finishing last. Ohio Gov. John Kasich's supporters have spent more on TV ads than any other presidential candidate, despite a late entry into the race. The battle fought through television ads is shaping up very differently this year than it has in past campaigns — both in terms of who is spending, and what kind of ads are breaking through. It used to be that when White House hopefuls got enough money, they would plow it into TV to show off their political and financial muscle. "Thus far, television advertising in the primaries has been more a sign of weakness than a sign of strength," says Elizabeth Wilner, who oversees the monitoring of political advertising for Kantar Media, an ad-tracking firm. Big-name candidates like Jeb Bush, Scott Walker and Marco Rubio have been holding back — though Rubio's supporters spent big earlier in the summer and have reserved ad space for later in the year. But Louisiana Gov. Bobby Jindal, who has had a tough time getting traction in the polls or in money, has been seen in plenty of ads on TV in Iowa this summer thanks to a friendly, well-financed superPAC called Believe Again. 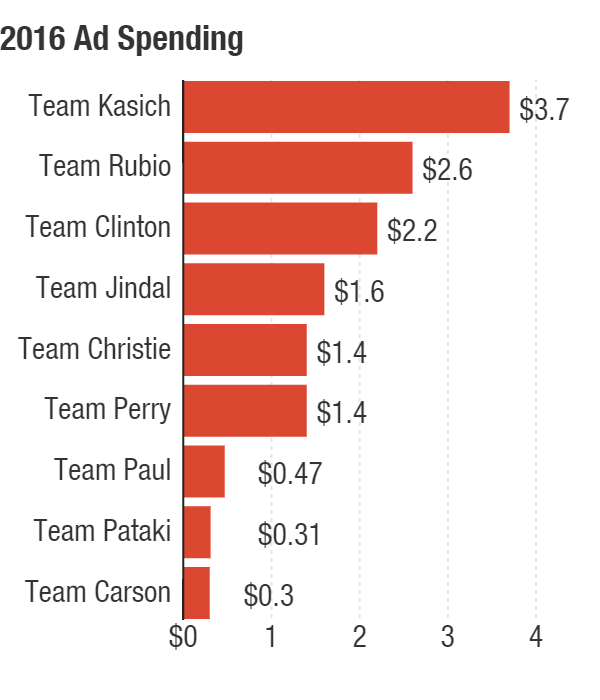 In all, superPACs supporting Jindal spent nearly $1.6 million as of Sept. 2, according to data from SMG Delta reported by NBC News. The strategy for Jindal was to gin up support in Iowa to enhance his national poll numbers, and possibly earn a spot in the top tier of the GOP debates. "It was definitely a bank shot. And it doesn't appear to have worked," says Wilner. Jindal will again appear in the undercard at Wednesday's second GOP debate in California, one of just four candidates on the early stage. Ohio Gov. John Kasich started his campaign relatively late, but the superPAC backing Kasich put him on TV in New Hampshire for a good part of July. The data from SMG Delta/NBC shows spending for Kasich stronger than any other candidate in the race: $3.7 million and counting. Kasich has qualified for the main stage for the first two debates. 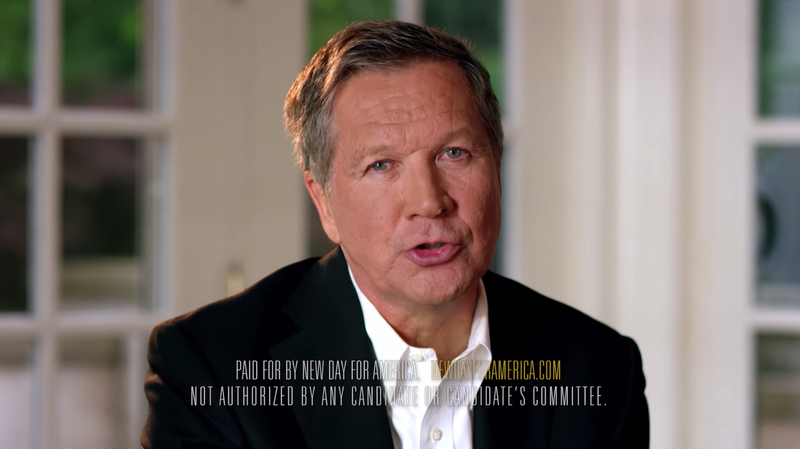 The differing fortunes for Kasich and Jindal point to another change in the 2016 campaign cycle — which ads are swaying voters. The Silicon Valley company Ace Metrix measures how people react to ads, and Senior Vice President Jeff Stewart notes, "Ads that have sort of a softer tone, at least at this stage in the game, definitely are seen as more effective, versus things that tend to be more screechy, more preachy in terms of their tone." But it may be defying the law of political gravity for these kinder, gentler messages to last much longer. Of course, there is one candidate who doesn't have to buy TV time — billionaire Donald Trump. Elizabeth Wilner says the Trump phenomenon "is another factor that has sort of turned things on its head this time. The candidate who has not only the lead but a growing lead depending on the polling you're looking at, hasn't spent a single dime on television advertising." But she also notes that Trump hasn't had to spend on advertising because he gets so much media attention without it. Political scientist Ken Goldstein, with the University of San Francisco and Bloomberg Politics, says that is why some big-name candidates are not engaging in the ad wars. In one sense, Goldstein says, that strategy makes sense: "Don't be screaming into the storm when you're not going to be heard. On the other hand, this campaign keeps going. At some point, it gets to be too late." As of the start of this month, data from SMG Delta/NBC didn't register any spending in support of Jeb Bush or Scott Walker. But in the past week, they have gone on the air. Bush's campaign announced a $500,000 ad buy targeting New Hampshire. A superPAC supporting Walker began a $7 million buy in Iowa. Since Trump shows no signs of quieting down, those candidates and their superPACs will have to decide when it's time to fully unleash the ad money. A previous Web version of this story stated that the Bush campaign had purchased $500 million in ads targeting New Hampshire. The correct figure is $500,000.